Wheel rolling simulation in QForm. Plastic strain distribution field.Ring rolling is a technological process typically used in the bearing industry due to its high precision, efficiency and performance. Due to increased use of rolled rings in industries such as energy (including wind power) and aerospace, demand is increasing for bearings and other parts produced by ring rolling including: aerospace engine components, flanges, gear sprockets, nuclear reactor parts, bearing bushes, pressure vessels shells and rope pulleys. The diameters of rolled rings can reach up to 10 meters and the directed – circumferential grain flow in seamless rolled rings is a unique property and very important advantage of the ring rolling process. 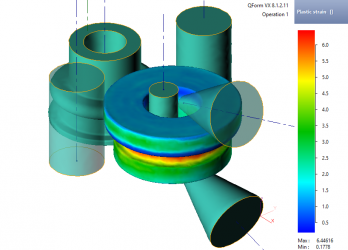 Because of very high demands in accuracy and reliability required for production of ring and wheel rolling, efficient simulation is needed for detail investigation and verification in extremely high-performance finite element simulation software. Ring rolling simulation in QForm. Ring rolling on radial-axial machine. Plastic strain distribution field. 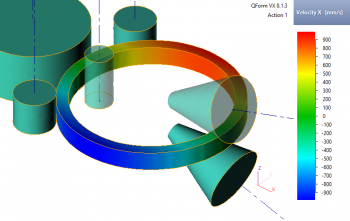 Profiled ring rolling simulation in QForm. Ring rolling on radial-axial machine. Temperature distribution field. 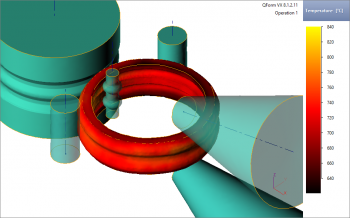 With help of simulation in QForm it is possible to reduce costs for developing and setting up ring rolling technological processes as well as to provide an optimal working regime of ring rolling machines. QForm helps predict the final shape, check the technology for the presence of defects and to estimate load and torque in all tools. 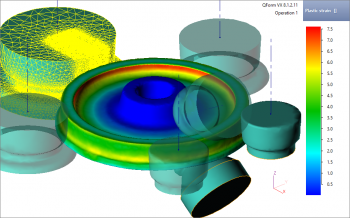 In the postprocessor simulation of tools, it is possible to check load gradient in the main and guide rolls and in the mandrel as well as to predict wear and deflections of the tools for a more detailed investigation of final ring shape. 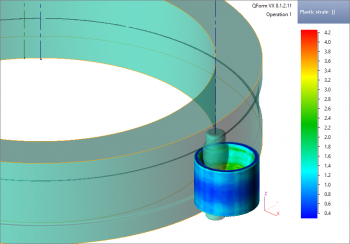 Bearing bush rolling simulation in QForm. Ring rolling on radial machine. Plastic strain distribution field. Ring rolling simulation in QForm. Velocity X distribution field. Interface to set ring rolling for various types of rolling machines such as radial, radial-axial and wheel rolling as well as rolling in case (frame).